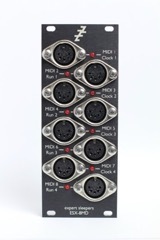 The ES-4/5 Controller software (part of Expert Sleepers Silent Way) allows the ESX-8MD outputs to be used for MIDI output (note - not just MIDI clock output, but as an actual MIDI port, capable of sending any MIDI messages). 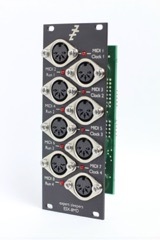 Since these outputs are driven from an audio connection, they have sample-accurate timing, which no USB MIDI interface can claim. Expert Sleepers ESX-8MD DINsync demo on Vimeo. Expert Sleepers ESX-8MD MIDI demo on Vimeo. The Polyphonic MicroBrute on Vimeo. Expert Sleepers ESX-8MD Multiple MIDI outs demo on Vimeo. The ESX-8MD requires software in order to operate, as noted above. Currently, the only such software is Expert Sleepers Silent Way, and our Max/MSP external. Note that MIDI functionality is only available via Silent Way. A Silent Way licence is not included with the ESX-8MD. The ESX-8MD is available now. Read ESX-8CV news articles on the Expert Sleepers blog.